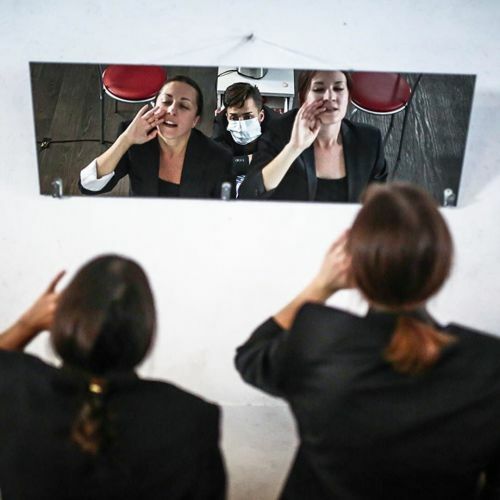 "Actresses inside a former garage in #Minsk, where the Belarus Free Theater stages plays. The troupe has never been authorized by the national government, and is thus not officially allowed to perform in Belarus. On the opening night of the 11th season, audience members were advised to bring their passports on the off chance they might be arrested by the Belarussian K.G.B. (It has happened before.) Somehow, the outlaw troupe has not only survived but also grown into the world's most visible and lionized underground #theater. This fall, @belarusfreetheatre is performing in London – where, unlike in Minsk, theatergoing is not a potentially imprisonable offense. @hudzilin photographed the #BelarusFreeTheater on #nytassigment." By nytimes on Instagram.